Scot’s TUFF™ P.O.G. 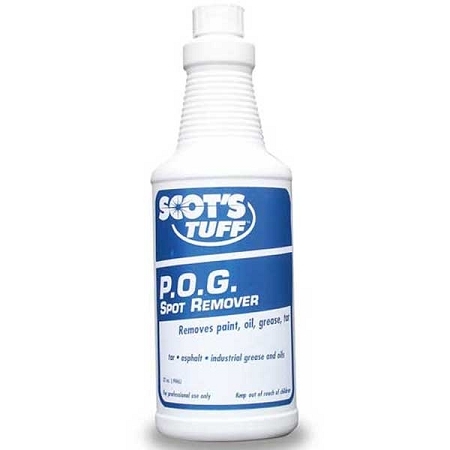 Spot Remover is an advanced formula that penetrates and removes tough paint stains and all kinds of factory grease, garage grime, cooking oils and more. Ready-to-use, no dilution required. Safe to use on most washable surfaces including carpet and upholstery. Use to remove grease, cooking oil, tar and asphalt, garage oil, butter, salad dressing, gravy and other tough, greasy stains. 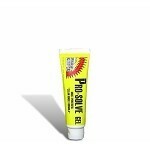 Remove any solid particles and residue. Wear plastic or rubber gloves. Test carpet for colorfastness; apply product to an inconspicuous area of carpeting with white cloth. If color transfers to cloth, do not use. Apply to affected area. Work into carpet and blot away stain with a clean, damp cloth. Reapply if necessary, but do not soak carpet. Carpet backing can be softened with overuse. For best results, extract with Scot’s TUFFPrimeTime Encapsulating Extraction Cleaner or UltiMax Plus Encapsulating Acid Rinse to remove residue and prevent resoiling.